Warning ! This receiver has no AGC, so has the potential to cause ear damage if not correctly used. If required, increase the the value of R15 to limit the audio output volume. The TDA1083 or TA7613AP is a one chip AM/FM radio, complete with audio amplifier. It has been around for a very long time so ICs should not be too difficult to obtain or salvage. 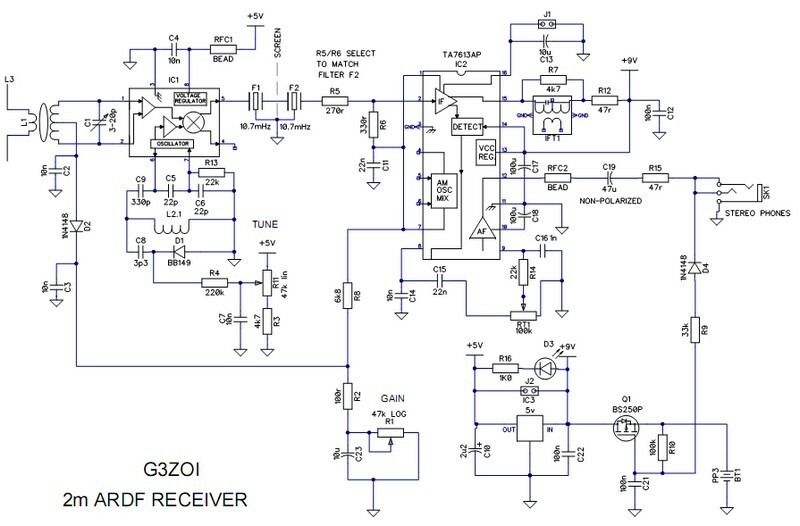 The ROX-2T uses a novel way of controlling the gain of the SA602 mixer (as found in the Elecraft K1 transceiver) but the SA612 must be directly feed by the stabilized supply voltage to the chip or a through a RFC, to minimize pulling of the VFO. The ROX-2T is not suitable for (FM) foxhunting. If the fox stops talking, there will be no modulation to detect! so it is squarely aimed at Radio-O using MCW/AM transmissions. NB. Windings shown left only apply to boards dated 3:07 and earlier. Please see download for update for boards dated 3:18 and later. Use a piece of 26swg wire 100mm long, folded in half. Tin the ends and centre fold. The easiest way to remove the enamel is to boil it off by holding the wire ends in a solder blob. The 3 element is based on the WB2HOL yagi described elsewhere on this web site. 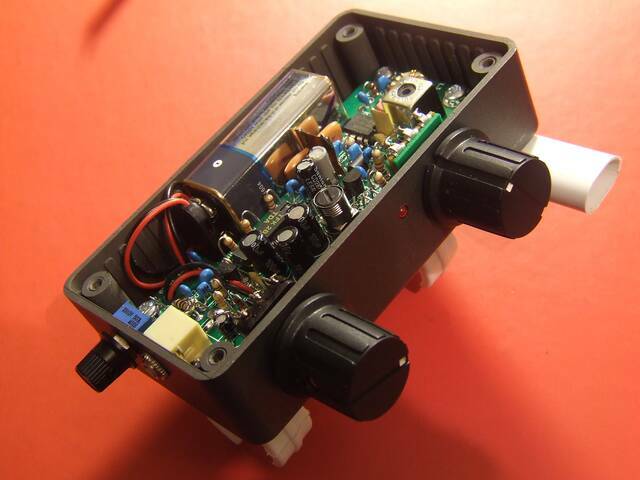 On the version for the ROX2 there is no hairpin loop because there is no requirement to match to a 50ohm feeder. The antenna is directly connected to the front-end of the receiver. The driven element is longer than shown in the WB2HOL yagi. The driven element connection to the ROX2 is the shown below. PDF DOWNLOADS & FURTHER INFORMATION. ** IMPORTANT ** MODIFICATION UPDATE, applies to 03:07 and 03:18 boards. When the gain is set to low, the SA612 draws very little current and the regulator output voltages rises slightly, pulling the VFO. This is probably due to the LED/D3 circuit line pulling up the voltage. Adding a 4.7k resistor across the 5v line fixes this, but adding 1mA to the current drain of the receiver. An alternative is to remove or modify the D3 circuit, but this has not been tested. When the receiver is very close to a transmitter, it has been noticed in some cases that limiting to the audio output occurs. This is very undesirable because, beyond the limiting threshold, audio volume will decrease as the signal increases and therefore very likely to give false indication of the transmitter direction. The obvious answer it to reduce the receiver gain when near to a transmitter but in the excitement of nearing a fox, this can be easily forgotten. The extent of the problem seems to depend on the IC type. With the TDA1083 and older TA7613ap limiting may not be significant and not require further attention. Adding a resistor between IC2/pin 8 and ground reduces the gain of the IC, and appears to suppress the effects of limiting. Limiting was significant with my current stock of TA7613ap. A value of 220k produced a noticeable improvement without overly compromising overall gain of the receiver. In the light of this problem I would recommend a 16 pin DIP socket is used for IC2 to enable alternative IC versions to be tried to get the best performance.